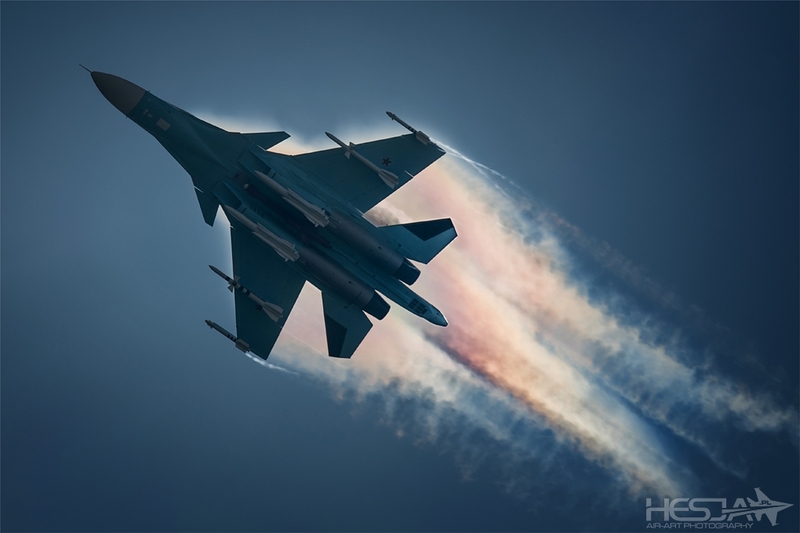 Following the crisis concerning the Annexation of Crimea, many of my friends decided not to take a risk, and they resigned from taking part in the MAKS 2015 air show in Moscow. I had no dilemma as such. It was just the opposite. I thought that since the international situation is getting more and more tense, then MAKS would be the best place for Vladimir Putin to perform a show of force, display some muscle. 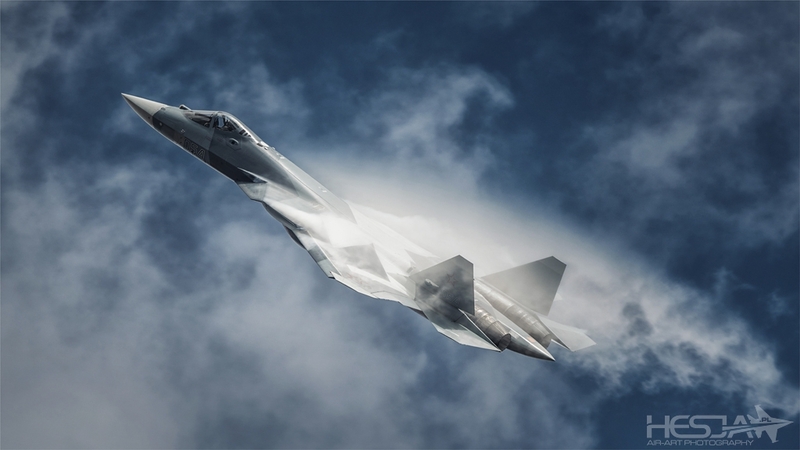 Going to Russia, I was hoping to witness magnificent displays of every piece of hardware remaining in the Russian arsenal, in a quantity that would bring me down to my knees. 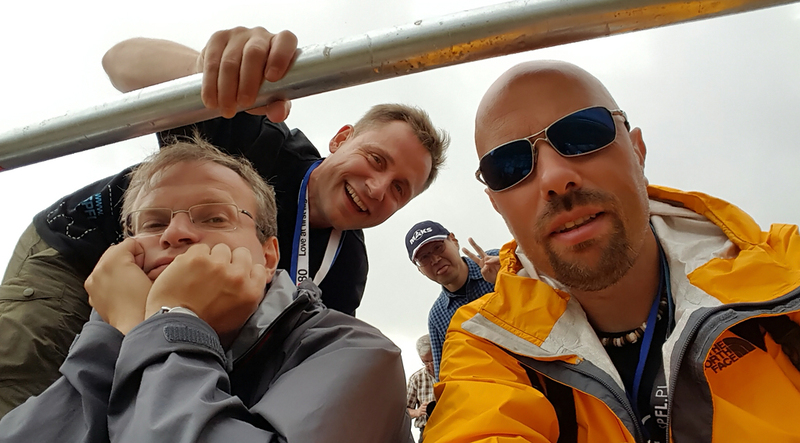 Unfortunately, since the very first days of the air show, it turned out that I was wrong. 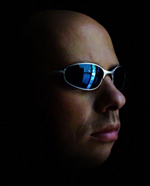 From the very beginning, the show was far from being stunning. 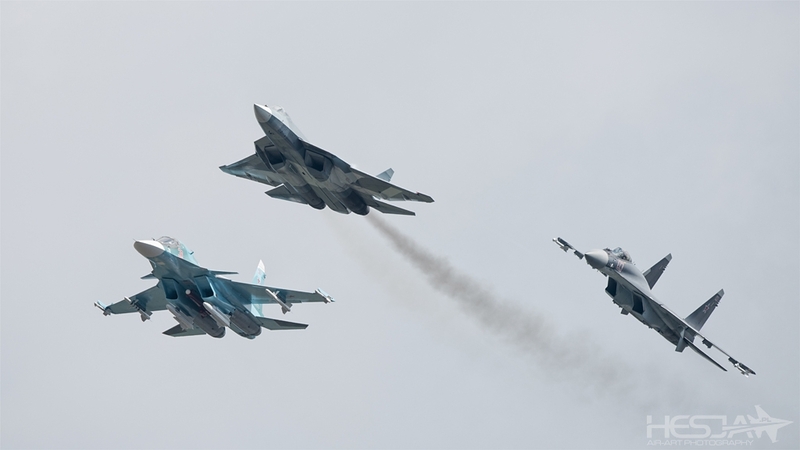 Small number of aircraft, even less action, scarcity of flares, I don’t know what was the message intended to be sent by Putin, however, surely, this was not a show of force. Comparing this air show to the preceding edition of 2009, when after Tuesday and Wednesday we were totally amazed, this year was not really impressive. Furthermore, to make matters even worse, not only was our favorite spot near the airfield’s fence covered with concrete, the Police was additionally throwing all of the photographers out of that place. We were left with the official area of the air show at our disposal, unfortunately located quite far away from the displays in the air, or, alternatively, we could also choose the area close to the Orthodox Church, which remained the only reasonable spot to take the pictures. 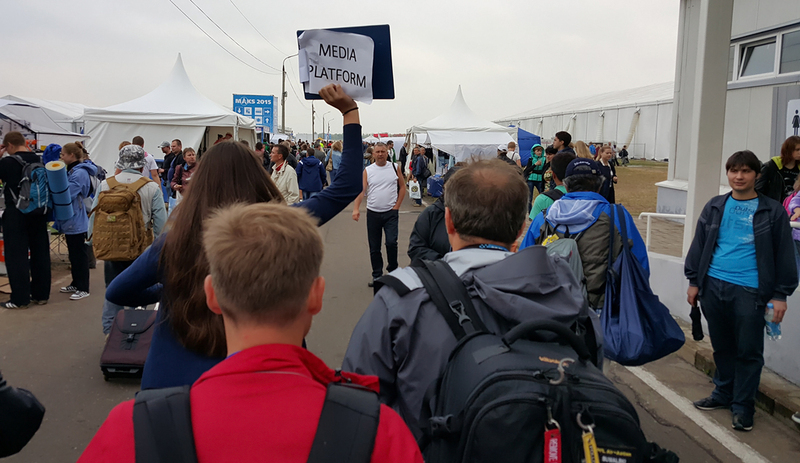 Desperately, we have even decided to buy tickets allowing us to take seat within the platform for the photographers – but this spot, due to shortage of the operations in the air, and due to the weak weather conditions, also did not get us impressed. 20 Minutes that Changed Everything! Saturday, August 29th 2015. We are headed towards the area of the airfield, similarly as on the day before, intending to use the photo platform again. The plan remains identical, the weather though, has changed. The sky is covered with numerous interesting rain clouds, with the Sun peeking out from time to time. I love the setting like that, since it makes it possible to take pictures which are very interesting. Considering the number of puddles, before we arrived it must have been raining quite heavily, and this may get us high level of humidity in the air. 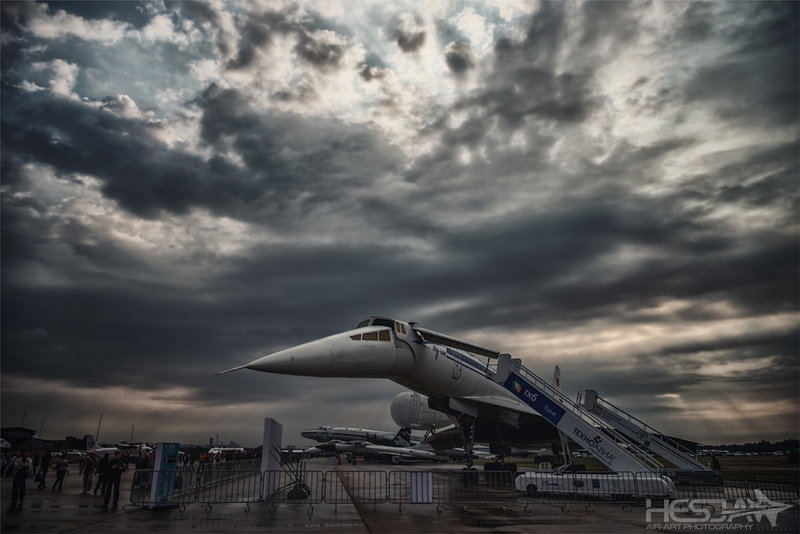 We have no time to look for good shots within the static display, since we need to quickly get to the press center. We have to get to the photo platform as fast as we can, as it is placed on the other side of runway. 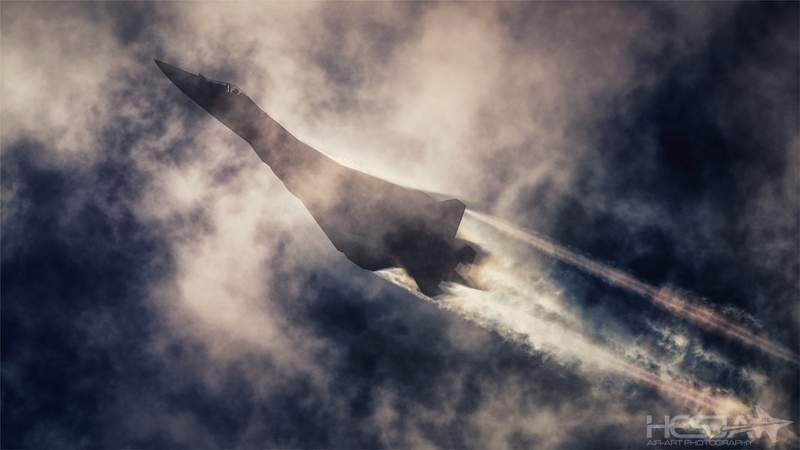 I cannot resist taking some shots of the Tu-144, with beautiful sun and clouds dancing above. The results of this playfulness perfectly highlight the uniqueness of this aircraft. We have already reached the platform. Unfortunately, our morning hope of magnificent weather conditions was gone, by the time we arrived. 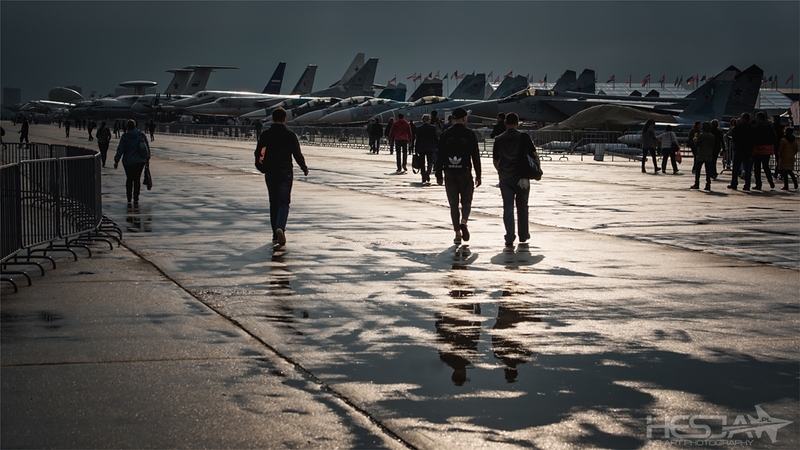 Not only did strong wind make the airfield area dry, our heads were also cleared of the thoughts of a good day. 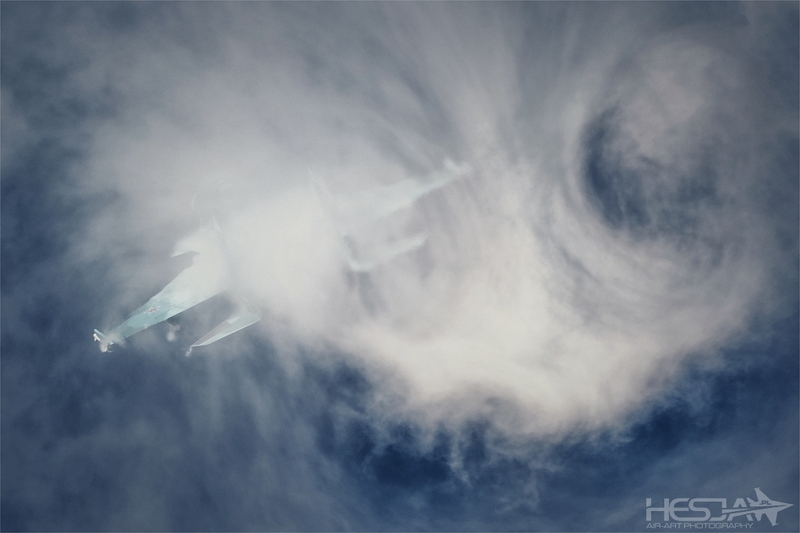 In the air – again – it was boring, both when it came to weather, as well within the scope of the displays. 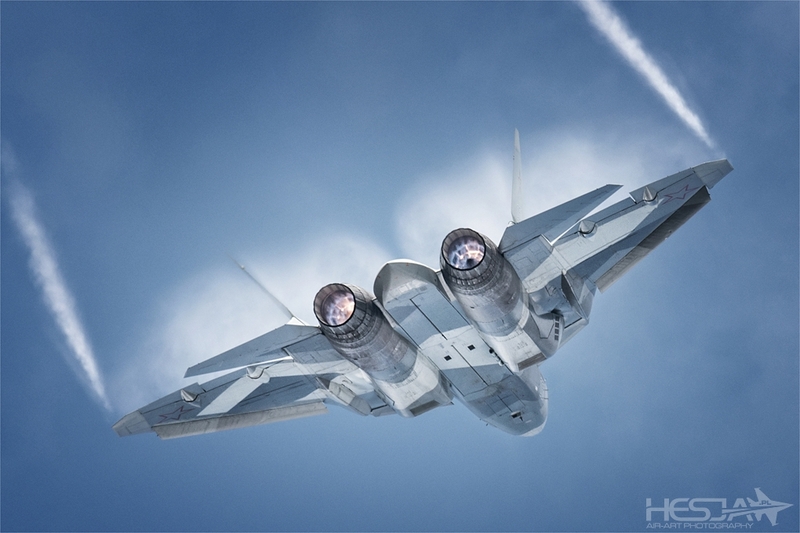 The show follows a standard schedule, with several Russian helicopters making a flypast, followed by some uninteresting designs, out of which a formation of two Yak-130 jets seems to evoke most of our emotions. 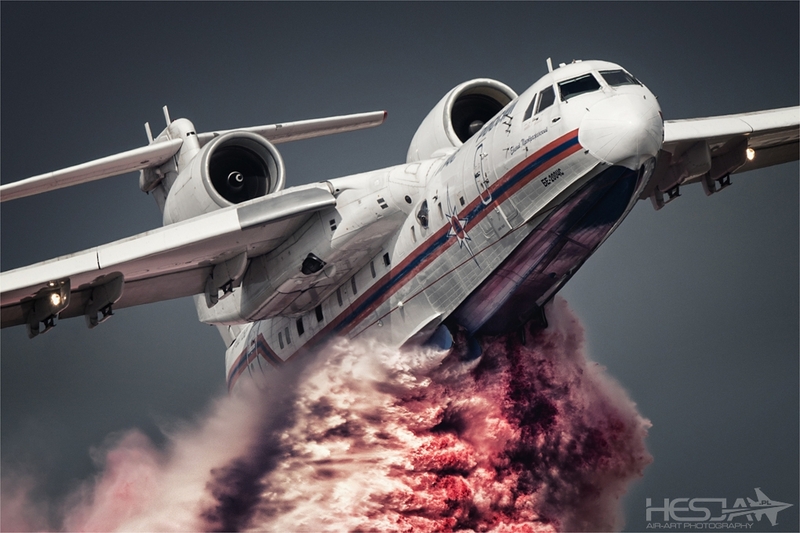 The boredom is interrupted by a water-dump from the Beriev Be-200 aircraft. It is always a superb moment. However, the wind is still blowing. Thanks to the wind, the weather changes once again. More and more dark storm clouds are visible all around. The cloudiness is getting greater, the color of the clouds is getting darker and darker. It’s no joke. A few seconds later, we are fighting against hundreds of liters of water which, along with the strong wind, deal with us, destroying the umbrellas and trying to get through rain covers, protecting our equipment. We are trying hard to remain on the platform, but this becomes less and less possible. Finally, we surrender, running away to the tent placed besides, joining a large crowd of photographers, packed inside of the shelter. An hour passes. The rain seems to be fading away, and we have noticed our favorite sound, coming from the runway. The show announcer can also be heard from the direction where the audience has been gathered, it is full of emotions. This may mean only one thing. 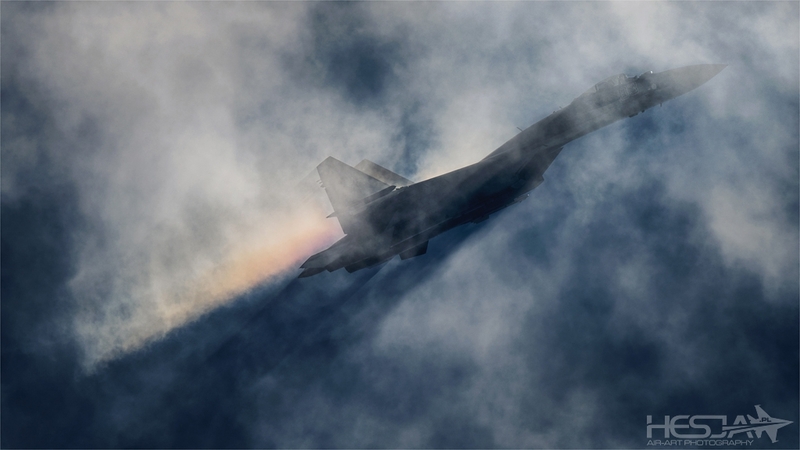 The elite portion of the show begins, with the best Sukhoi combat aircraft getting ready for take-off! 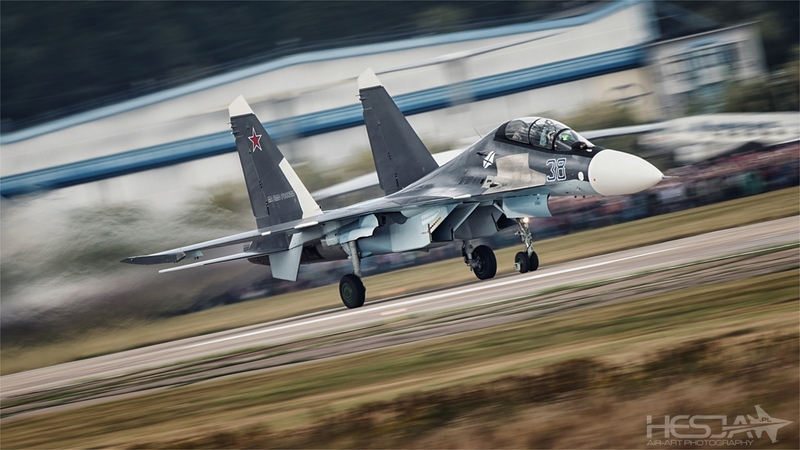 We go back onto the platform, taking our cameras out – in the nick of time, since just a few moments later, along the runway flooded with water, we can see the T-50 PAK-FA, Su-34 and Su-35 taking off! I look up to the sky... regrettably it is completely blanketed with clouds... But wait a minute! I look in the direction from which the wind blows, and notice a small, blue spot. I cross my fingers, since should everything go as I expect, there’s a chance for a bingo! The jets have taken off and flew somewhere else, to form up. I am looking at the blue spot which is getting bigger and closer, closely watching the horizon in the southeast, looking for the formation. I am hoping everything goes as if it was to be well orchestrated, and the jets arrive at the perfect moment, not too late, not too early. The blue sky is getting closer and closer, it is almost above us, and hearing the announcer, one may come to a conclusion that the jets have to be close to us too. There they are! A beautiful formation. T-50 leads it, on the right we can see the Su-34, and the Su-35 is flying on the left. They perform a spectacular break right in front of us. 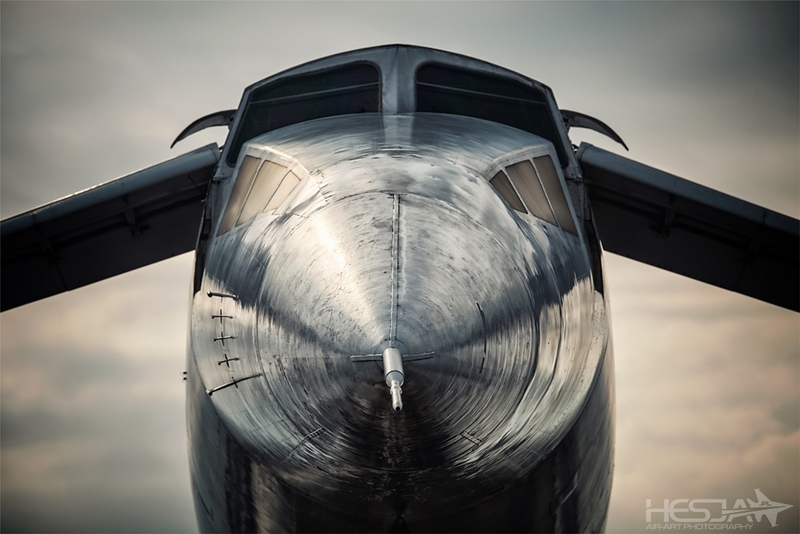 All three aircraft create beautiful clouds of condensation on their fuselages, and this tells me, well, this yells at me, that this is it, and that the conditions are nothing short of perfect! Craziness of vapor clouds begins right above our heads! 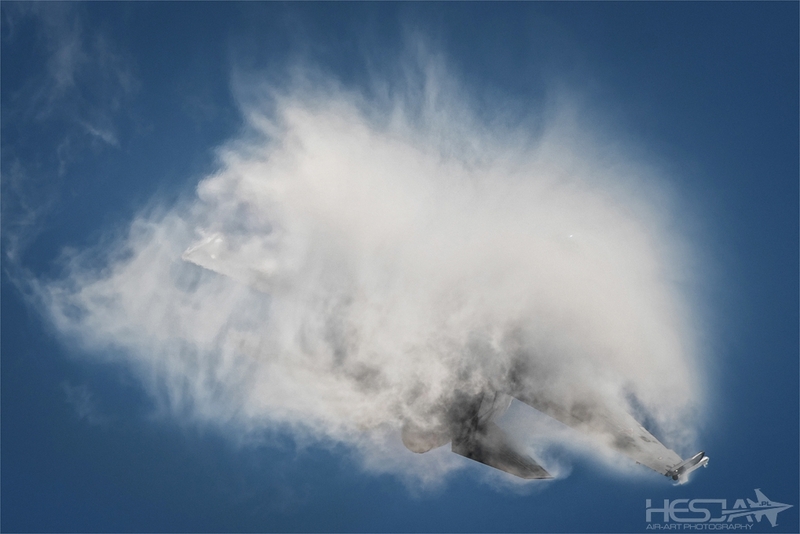 So much humidity remains present in the air, that even the tiniest maneuver causes condensation to appear on the flying aircraft. 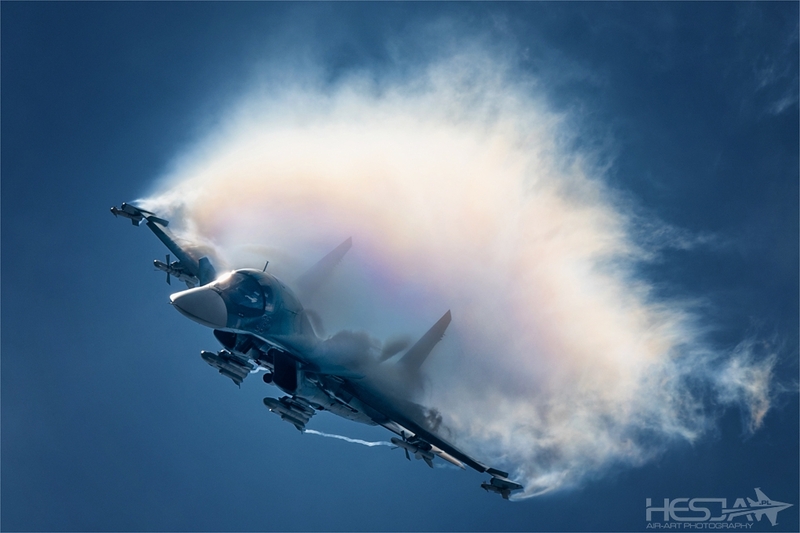 If during the break, Sukhoi has provided us with a vapor spectacle, then what should we expect during the dynamic display? I am talking to my friends, laughing, that the weather is so awesome that it is enough to wave your hand, to see condensation forming all around it. 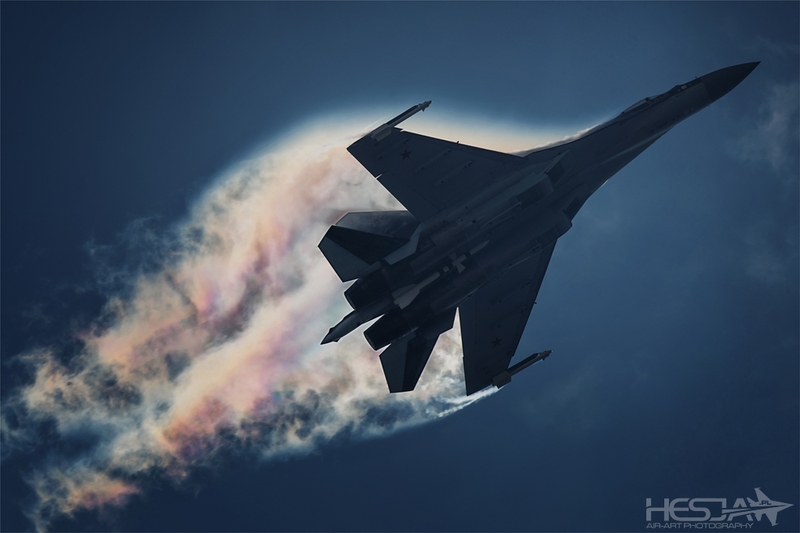 Su-35 begins its display. And the very first pass is jaw-dropping. 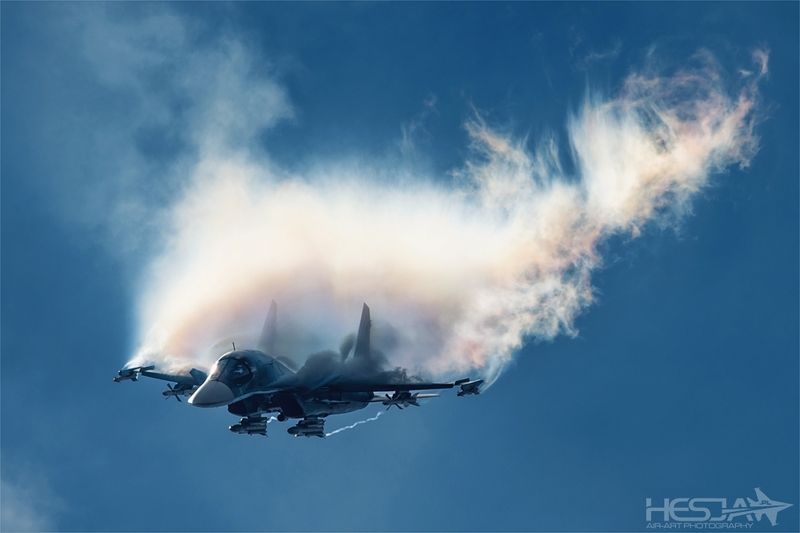 Behind the aircraft, mighty white vapor trails have been formed, creating a beautiful image full of contrast, thanks to the blue background of the sky. 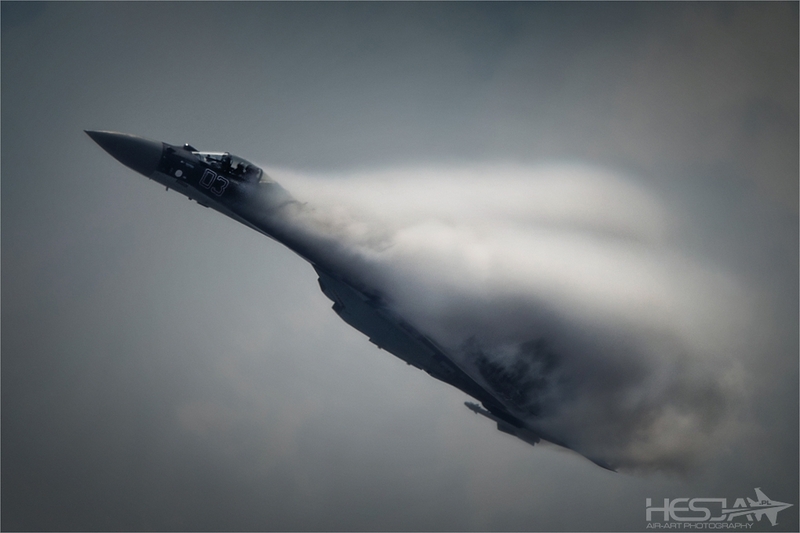 At some moments the quantity of vapor is so great, that even the aircraft becomes invisible. 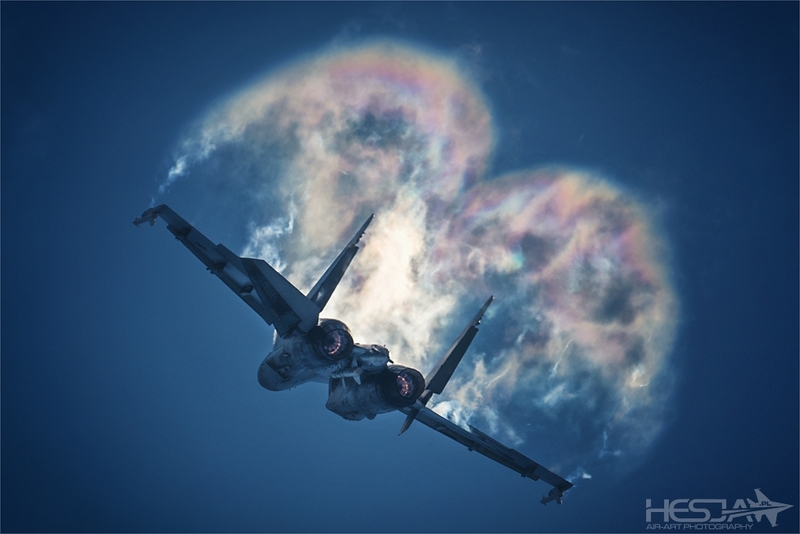 Su-35 is followed by its brother, Su-34. It looks armed and dangerous, since it carries a lot of payload under the wings. The sky is even clearer, which intensifies the sunlight. 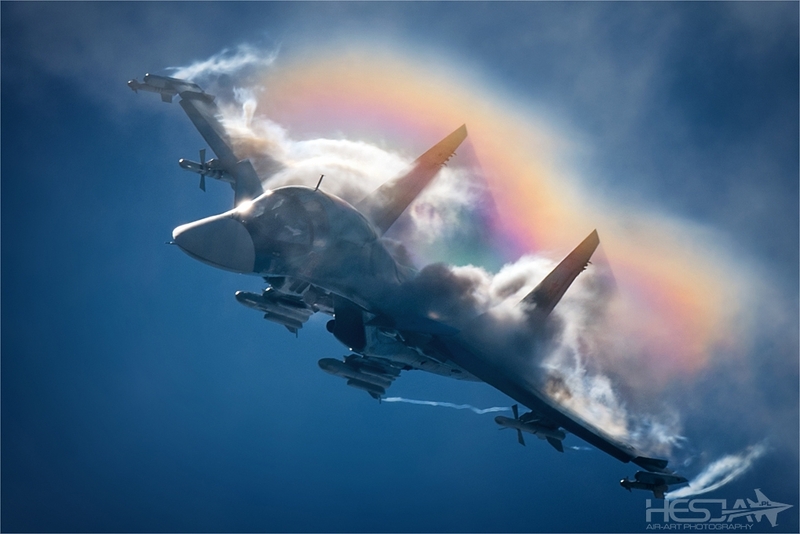 The vapor condensation behind the aircraft, with the sun in the background, always translates into the beautiful phenomenon of iridescence. Thanks to this phenomenon, through our viewfinders, since we cannot take our eyes from them, continuously taking pictures, we are seeing a true show of magic! It was crazy! 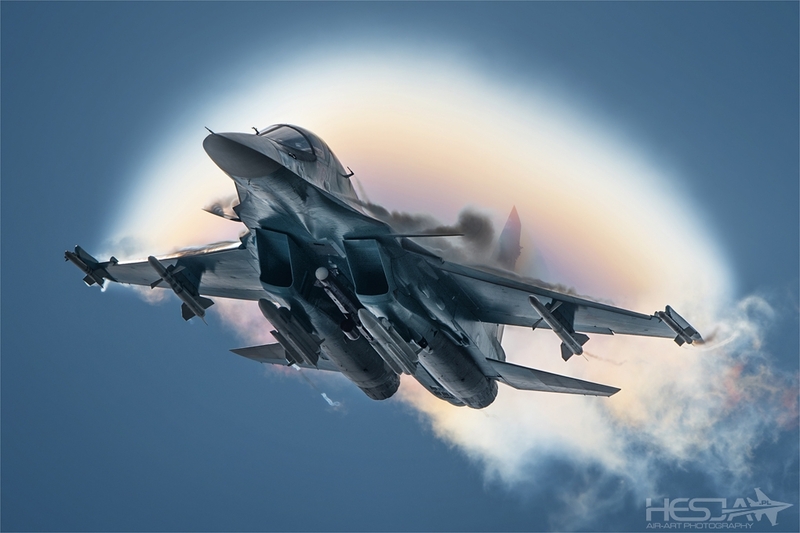 One pass made by the Su-34 Fullback will, without any doubts, go down in history! I cannot believe what I see. And this is not the end! 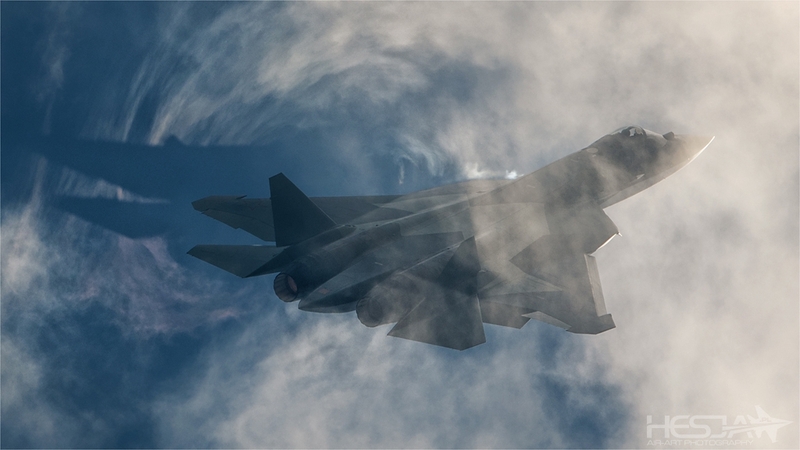 The latest masterpiece designed by the Sukhoi engineers enters the sky, the aircraft which is the greatest pride of Russia, T-50 PAK-FA. 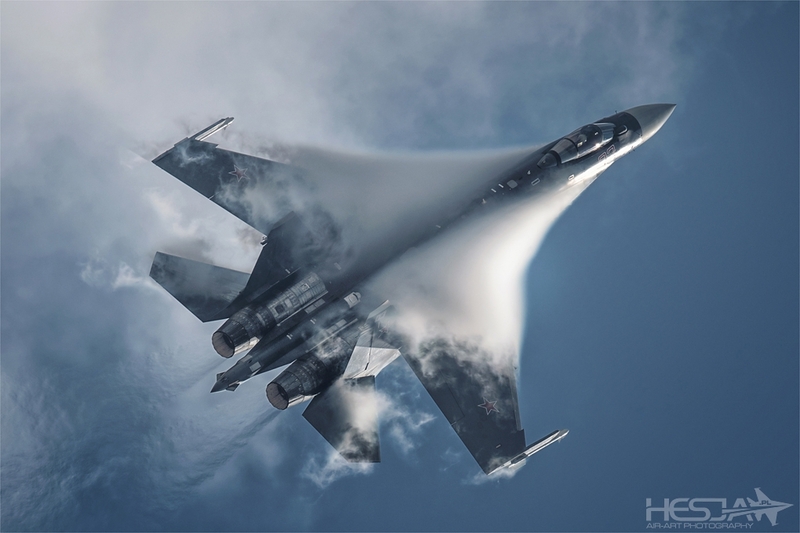 The “Shovel” - this is the nickname given to this jet by the Russians, due to its peculiar shape – creates wonderful clouds of vapor, right above our heads. 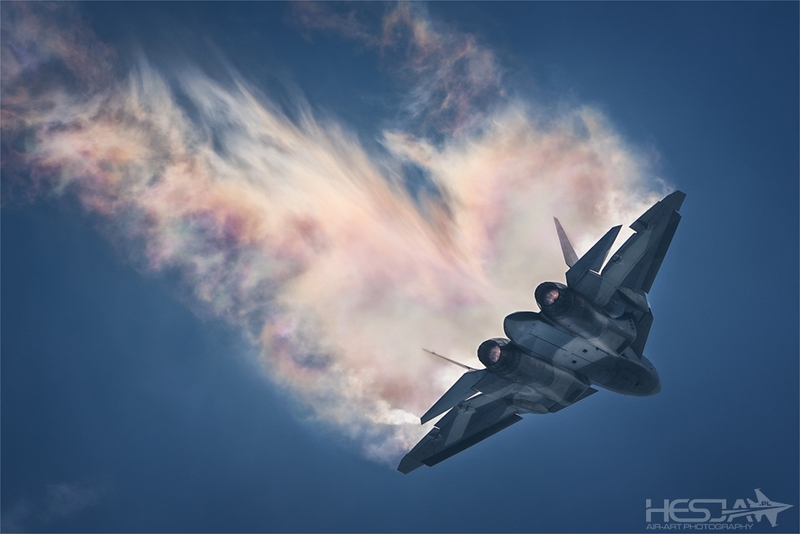 The vapor cones, iridescence and many other beautiful phenomena we can admire during this display are better than anything I have seen so far, when it comes to the T-50. The display comes to an end. I am sitting down on the boards forming the platform and I cannot believe what I have just seen. A quick look at the display of my camera, and a quick review of the pictures I have taken, act like a pinch, I was not dreaming. The show began on 11:52AM and it came to an end on 12:12PM. Twenty minutes which, photography-wise, were better of some of the largest air shows to which I have been. Twenty minutes, with pictures taken that could make it possible to create several albums. Twenty minutes that have made MAKS 2015 trip unforgettable. Twenty minutes which transformed the worst edition of Aviasalon, as it may have seemed at the time, into absolutely the best one!